Romani residents of the Czech town of Rotava are expressing their dissatisfaction with the fact that the Workers‘ Social Justice Party (Dělnická strana sociální spravedlnosti – DSSS) will be holding an event there. News server iDNES.cz reports that the town hall has rented out its „Slovanský dům“ cultural center to the party for an event on 28 January. Local Romani residents consider the meeting planned in Rotava by party chair Vandas to be a provocation. Mayor Iva Kalátová argued to iDNES.cz that the hall was not being rented by the town, but by the cultural and information center itself, and that there was no reason to reject the party if what will be held there is a meeting. „We do not have the right to ban it,“ the mayor said. Kalátová’s statement makes it seem as if the cultural and information center is an independent entity and as if the mayor had no influence over the decision. However, Hana Mašková of the center claims to be just an employee. She says the center is linked to the municipality and she cannot take independent decisions: „Madame Mayor and the other town councilors knew about this rental,“ Mašková elucidated to news server Romea.cz. „This is unnecessary, things are calm in Rotava. We will not be protesting against their event. It does worry us that the town has given the Workers‘ Party permission and rented the Slovanský dům to it. That’s bad news,“ Robert Koky of the Romani association Meta told iDNES.cz. Last fall Meta declared that it intended to get children off the street and improve the situation inside the Romani community. Some 200 people yesterday attended a meeting in support of a local family that was allegedly attacked by Romanies in Varnsdorf on January 1, and they criticised the Town Hall for not solving the security situation in the town. The protesters blame politicians for not having reported on the incident truthfully. Local politicians namely said after the attack that the man may have caused the injuries himself under the influence of alcohol and that the assault was not recorded by a camera-monitoring system. None of the assaulted family’s members came to the meeting on the square in Varnsdorf. However, a daughter of the allegedly attacked man thanked the participants for their support in a latter that the organisers read loud. Five Romanies allegedly assaulted her parents outside the Sport dormitory in Varnsdorf in the night on January 1. The police classified the act of one of the perpetrators as racially motivated. Local residents criticised the town management for passivity. They recalled that the Town Hall promised after the previous protests last August and September to open a police station outside the Sport dormitory but it has no done it yet. The Town Hall says it is to be opened next week. Crime has been rising lately in towns in northern Bohemia’s Sluknov area, known for tense relations between the majority population and Romanies. Local residents blame Romanies for the crimes, mainly frequent thefts and assaults. „No one is dealing with it. Then anti-Romany moods arise. And these protests are their consequences,“ said Josef Masin, who organised a meeting in the nearby Rumburk on August 26, 2011, which stirred up a wave of anti-Romany protests in the Sluknov area. 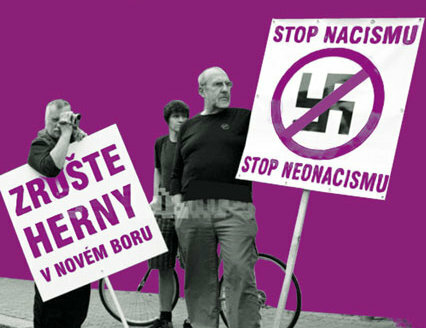 Almost 1000 people took part in the so far largest rally held in Varnsdorf on September 10. Policemen prevented the protesters from approaching Romanies‘ dormitories. Supporters of extremist movements also took part in the event. Some extremists attended yesterday’s meeting. A flag of the far-right Workers‘ Party of Social Justice (DSSS), successor to the abolished Workers‘ Party (DS), appeared in the crowd. Police monitored the meetings, but they did not have to interfere. Another 100 hundred days and the French presidential campaign will come to a head. Never far away from the political disputes among the top contenders is immigration. And the Roma, along with irregular migrants, are once again centre stage. On Tuesday (10 January), France’s interior minister Claude Gueant boasted to reporters France had surpassed its deportation quota for 2010 by 4,000. Around 32,000 people were forced to leave last year. Among them were a couple thousand Roma, rounded up and shipped primarily to Romania and Bulgaria. The Roma round-up drew fire from the United Nations and EU justice and fundamental rights commissioner Viviane Reding – „Discrimination on the basis of ethnic origin or race has no place in Europe,“ she said at the time. France, however, is quietly continuing its deportation policy of the disenfranchised EU citizens. President Sarkozy’s hard-line against one of Europe’s most maltreated minorities appeals to the sensibilities of the country’s far right voters. Socialist contender Francois Hollande’s poll lead in the presidential elections has dropped from around 35 percent in December to 27 percent, just four points ahead of Sarkozy. Always a menace, Marine Le Pen, the far-right candidate is at a steady 17 percent. Along with Gueant, Sarkozy decided last year to ban begging throughout the more affluent Parisian neighbourhoods. The ban was supposed to end this January. It has since been extended to the summer, reports The Guardian newspaper. Paris‘ socialist mayor, Bertrand Delanoe, called the ban a PR stunt designed to stigmatise a part of the population. Sarkozy has also promised to stamp out illegal Roma camps and deport them. He also drew a direct correlation between crime and immigration. Most of France’s 15,000 Roma eek out desperate lives in the Paris and Marseille outskirts. At the Paris North Station, Romanian police officers stroll the tarmacs alongside their French counter-parts. In Marseille, some entire Roma families live on the streets. Elsewhere, Roma camps are being bulldozed with no alternative shelter given. Many are turned away from homeless shelters and denied access to basic medical attention, according to Medecins Sans Frontieres. „The situation of the Roma in Marseille is desperate,“ Jean Francois Corty, the director of the NGO’s French mission told this website, adding that the French government is prioritising security over public health. France, along with all other EU states, has agreed to set up an EU framework designed to facilitate Roma access to education, employment, health care, housing and basic related services. „There is a real violence against the Roma in France,“ continued Corty. Three youths who have recently confessed to murdering a Romani woman in the Prague 3 district of Jarov were not first-time offenders but had previously assaulted a homeless couple not far from a trail that leads from a local housing estate there into a wooded area. Local residents say the youths did not attack homeless people only, but basically anyone they felt like targeting. „All three of them are young guys who have been getting ready to do something like this ever since they were little. It doesn‘t even really surprise me. The oldest assailant is from a broken home and his mother evidently couldn‘t manage him. He’s done whatever he wanted. Everyone knew they had been in conflicts with the homeless people. A year ago they threw stones at them. One of them is also part of a group that attacked me when my wife and I were out for a walk,“ a local resident told news server Romea.cz, who did not want his name published out of fear for his safety. For the Roma minority of Tanvald, a quiet town of 10,000 in north Bohemia’s Jizerské Mountains, the Jan. 7 burial of 22-year-old Ladislav Tatár required by-the-books organization. Observed by a population fearing retribution for a mysterious New Year’s Eve shooting that left Tatár dead and his older brother injured, community leaders sought to ensure no clashes marred the funeral and memorial march, despite a martial atmosphere that has pervaded the town since the incident. Tanvald Mayor Petr Polák had summoned national anti-conflict police to prevent the type of ethnic clashes that erupted elsewhere in north Bohemia during the late summer of 2011. These officers looked on as a crowd of 300-plus accompanied Tatár’s coffin to the hilltop cemetery, somberly observing traditional Roma rituals. Six men bore Tatár’s coffin out of the church, knocking it superstitiously against the threshold to ensure the deceased’s soul would not return. Others navigated mourners and supported devastated family members, some of whom lost consciousness during the ceremony. Den Randalierern bei einem Hamburger Fußball-Hallenturnier in der vergangenen Woche droht ein juristisches Nachspiel. Der Vorsitzende des Zentralrats Deutscher Sinti und Roma, Romani Rose, habe bei der Hamburger Staatsanwaltschaft einen Strafantrag gestellt, teilte ein Sprecher des Zentralrates am Mittwoch in Heidelberg mit. Der Antrag richte sich gegen Beteiligte der Massenschlägerei etwa wegen der Verwendung rechtsradikaler Parolen wie „Zick Zack Zigeunerpack“. Der Hamburger Oberstaatsanwalt Wilhelm Möllers bestätigte den Eingang des Strafantrages auf dapd-Anfrage. Es gehe um den Vorwurf der Volksverhetzung und Beleidigung. Nach übereinstimmenden Zeugenberichten hatten die organisiert auftretenden Gruppen aus Lübeck diese Parolen laut Zentralrat zur Aufhetzung der Stimmung gegenüber den gegnerischen Fans lautstark skandiert, bevor es gegenseitig und gegenüber der Polizei zu Gewaltexzessen mit vielen Verletzten kam. Merseburg/Magdeburg – Die Gedenkstele für die von den Nazis im Vernichtunglager Auschwitz-Birkenau ermordeten Sinti und Roma im sachsen-anhaltinischen Merseburg wurde innerhalb von knapp zwei Jahren sieben Mal geschändet. Zuletzt spuckte am Neujahrstag ein 19-Jähriger trotz installierter Videokamera auf die Gedenkstele. Am Abend des 30. November 2011 hatten zwei vermummte Männer Hakenkreuze auf die Granitsäule gesprüht. Auch in Magdeburg gibt es immer wieder Übergriffe auf ein Mahnmal für ermordete Sinti und Roma. So wurde das Denkmal der Nacht zum 15. August vergangenen Jahres mit volksverhetzenden Parolen beschmiert. Jerusalem’s Domari (also known as Romani or Gypsy) have lived in historic Palestine for over 500 years. Many fled during the 1967 War, ending up in refugee camps, and the community now numbers 60 to 70 families. Palestinian Romanis face a slew of social issues, including poverty, high illiteracy rates, and racism from both Israelis and Palestinians. Den Braun-Weißen wird es zu bunt. Die Vereinsspitze des FC St. Pauli trifft sich am heutigen Donnerstag mit dem Hamburger Innensenator Michael Neumann (SPD) und der Polizeiführung. Dann werden harsche Worte fallen, denn der Fußballklub ist reichlich verärgert über einen Knüppel­einsatz gegen seine Fans während eines Hallenturniers am vergangenen Freitag. Dabei wurden auch der Sicherheitschef der Paulianer, Sven Brux, und ein Aufsichtsratsmitglied in Mitleidenschaft gezogen. Außerdem wehrt sich der Verein gegen Schuldzuweisungen, die eigenen Anhänger hätten die Prügelorgie ausgelöst. Was war geschehen? Beim traditionsreichen Turnier in der Alsterdorfer Sporthalle waren Fans des VfB Lübeck und des FC St. Pauli aneinandergeraten. Polizisten griffen ein, Schlagstöcke gingen auf die Zuschauer nieder, Pfefferspray waberte durch die Luft. Die Bilanz der Polizei: mindestens 90 Verletzte und 74 Gewahrsamsnahmen, davon 72 Pauli-Anhänger, sowie zwei Festnahmen. Soviel ist unbestritten. Doch über den Verlauf der Ereignisse gibt es gegensätzliche Darstellungen. Ich ging hinter meinem Bruder her und schaute auf meine Füße, damit ich nicht stolpere. Dort gibt es keine Straßenlaternen, es war dunkel. Plötzlich hörte ich einen Schuss, mein Bruder viel mir blutüberströmt vor die Füße. Ich hatte keine Ahnung, was los war. Ich kniete mich neben ihn und schrie ihn an, er möge mit mir sprechen. In diesem Moment sah ich den Mann, wie er über mir stand, hörte einen weiteren Schuss und verspürte einen starken Schmerz im Bauch. Er weist außerdem den Vorwurf zurück, er und sein Bruder wären zum Klauen unterwegs gewesen. Zu einer Ortsbegehung wurde nur der Täter, nicht aber das überlebende Opfer geladen. Die Ermittler kamen dann auch zu dem Schluss, der Rentner habe ich Notwehr gehandelt. Der Täter habe sich gegen eine Messerattacke geschützt, teilte die zuständige Kreisstaatsanwältin Lenka Bradačová mit, somit handle es sich also nicht um Mord. Durch Gutachten soll nun geprüft werden, inwiefern der Einsatz der Schusswaffe in der Situation angemessen war. Eine rassistisch motivierte Tat wurde übrigens von Anfang an ausgeschlossen, obwohl der Bürgermeister Petr Polák (Bürgerdemokraten, ODS) von aktuellen ethnischen Spannungen zwischen der Mehrheitsbevölkerung und den Roma spricht. Unlängst wurden Roma aus anderen Teilen Tschechien uns der Slowakei in der 7.000-Einwohner-Stadt angesiedelt. Er war weit entfernt davon, unschuldig zu sein. Sie [die Roma] müssen wissen, dass wir uns verteidigen werden, wir werden es nicht zulassen, ausgeraubt und angegriffen zu werden. Wir haben Kinder und wir bekommen Angst, sie allein auf die Straße zu lassen. Auch im nordböhmischen Varnsdorf gehen seit Beginn des Jahres die antiziganistischen Ausschreitungen weiter. Nachdem die antiziganistischen Demonstrationen Ende Oktober 2011 mit Wintereinbruch zum Erliegen gekommen waren, gab es an den ersten beiden Wochenenden des neuen Jahres wieder Aufmärsche mit 50 bzw. 200 Teilnehmenden. Wie bereits im Herbst wird ein angeblicher Rassismus der Roma gegenüber der Mehrheitsbevölkerung als Begründung herangezogen. Tatsächlich wurde eine dreiköpfige Familie in der Neujahrsnacht mit Verletzungen in Krankenhaus eingeliefert. Am 2. Januar erstatteten sie Anzeige, sie seien vor dem „Hotel Sport“ (einer der Sammelunterkünfte für Roma in Varnsdorf) von Roma angegriffen worden. Seit den Ausschreitungen im Herbst wird das Gebiet mit Videokameras überwacht. Von einem derartigen Angriff war auf dem Überwachungsvideo nichts zu sehen. Du browst gerade in den Antiziganismus Watchblog Weblog-Archiven nach dem Monat Januar 2012.